Our Feathers Template Pack adds sixteen new shapes that mimic the delicate "feather" motif found in quilting. Perfect for quilts and other fiber art projects, but versatile enough to enhance any design. Feather shapes come in 8-, 10-, 12-, 16- and 20-segment variations. 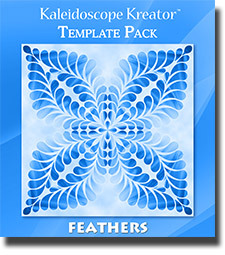 NOTE: The Feathers Template Pack is an add-on product for Kaleidoscope Kreator 3, and can only be used if Kaleidoscope Kreator 3 is already installed on your computer.